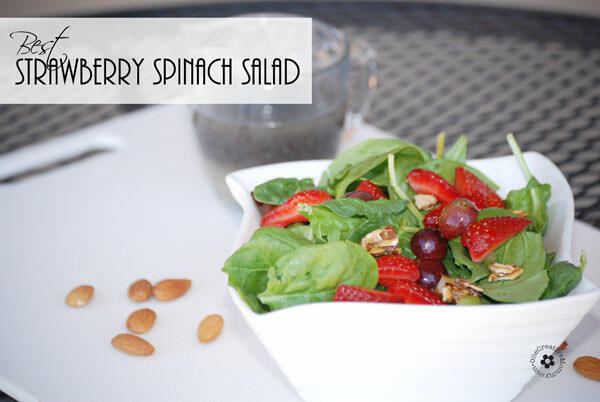 You are here: Home / Blog / Best Strawberry Spinach Salad! When we were first married, just for fun, my hubby’s work hosted a lunch party with a contest for best salad. 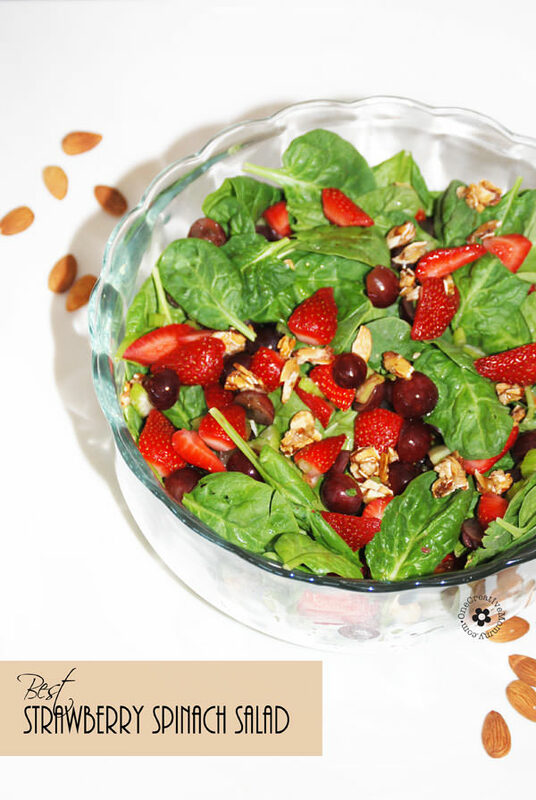 Having a little more time on my hands back then, I combined some things from my favorite salads and came up with the best Strawberry Spinach Salad ever! Not only did it win the contest, but I get asked for the recipe every time I take it somewhere. Every time. I’d say that’s a winner! By the way, happy Labor Day to all of my readers from the United States! I hope that many of you have the day off and can enjoy it with your family. We don’t get to go on trips very often, but we’re excited to visit the Ogden, Utah LDS temple today. It opens soon, and we get to tour the inside before it is dedicated. I’m so excited for my girls to see it! Make sure that your spinach is dry, or the dressing will not stick to it. Toss ingredients together in a large salad bowl. Do not add dressing until ready to serve. Allow dressing flavors to blend before adding it to the salad. Combine all ingredients in a salad dressing shaker bottle. Shake until blended. Pour dressing over salad to taste and toss gently. This recipe makes quite a bit of dressing. Use all of it, or just use some–depending on your taste. Serve immediately. *For best results, dressing should be made ahead and allowed to sit so that the sugar can dissolve and the flavors can blend before putting it on the salad. The spinach will absorb the dressing as it sits, so this salad is best eaten immediately. This is my all-time favorite salad. What’s yours? I’d love to hear about it in the comments! This looks great, sweet wholesome ingredients, and I love that white bowl! Saying hello from create link and inspire! Thanks, Cathy. The bowl is from a garage sale. I love it, too! Thanks, Melanie. It really is super yummy! Have a great week. I love a good strawberry salad. This does look like a winner! Thanks, Heather. It definitely is a winner! I could eat the whole recipe myself. I love dabbling in making my own salad dressing. 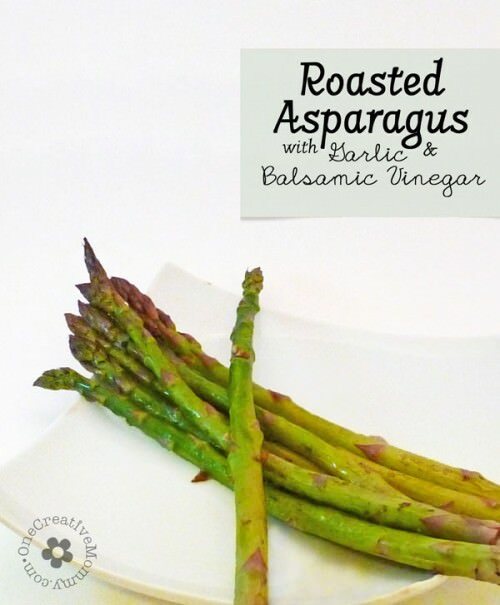 I can’t wait to try your poppy seed dressing! Thanks, Brianna. It’s definitely easy and yummy. Thanks for taking the time to comment. I’ve made a similar salad but never added grapes or a homemade poppyseed dressing! I bet those are great additions. Look forward to trying it! You should definitely try it, Michelle. They make it to yummy! I hope you like it. Sugared almonds and strawberries – SWOON! It’s a dessert salad! I could eat this salad for dessert for sure! Thanks, GiGi! 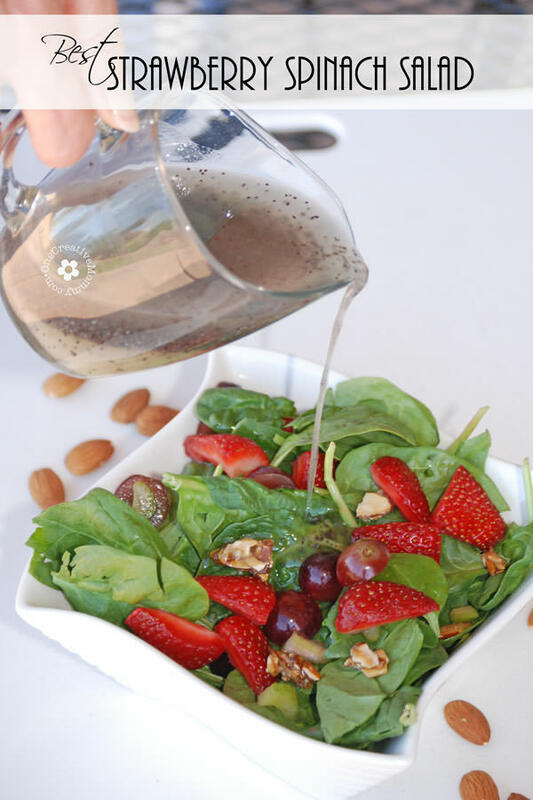 Heidi, I LOVE this recipe and I’m so glad you shared your recipe for poppyseed dressing! 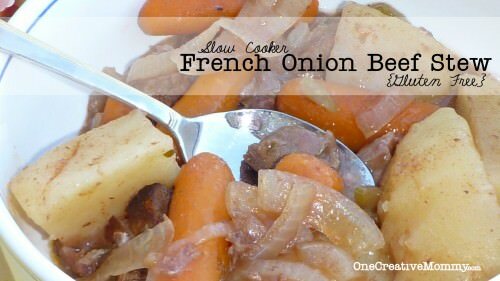 I’ve never made this before but I’ll be trying it soon! Watch out, Marilyn! You’re going to love it! 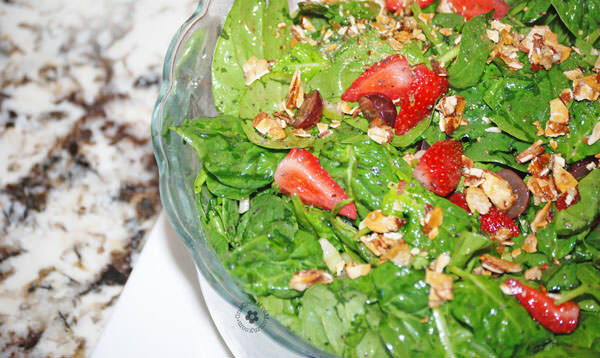 I often make a strawberry spinach salad as a side for dinner and everyone loves it. But I’ve never made my own Poppy Seed dressing, so I’ll give that a try, too– thanks!! The dressing is really easy, Mitzi. You should definitely give it a try! Looks so good!!!! A friend of mine makes a salad just like this and now I can without stealing her recipe lol I love a good salad. This looks refreshing. Pinning! It’s as good as it looks, Dee. Definitely give it a try. I hope it’s as good as or better than your friend’s recipe. Looks so yum! I love strawberry-spinach salad, but I’ve never had it with sugared almonds. That sounds awesome! Oh, my goodness, Elise. 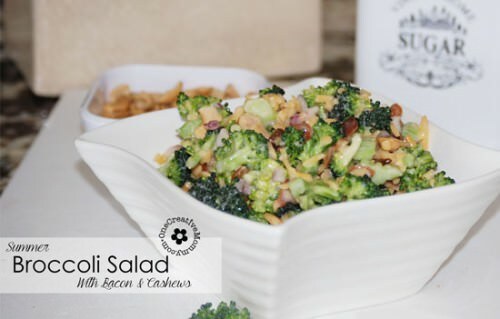 The sugared almonds make the salad soooo good! You should definitely try it! Oh wow, your salad looks AMAZING! I love strawberries in a salad – it’s that salty/sweet combo. Thanks for linking up at Let’s Get Real. I’m off to follow you everywhere :) Can’t pass up on seeing your beautiful photos. Amanda, you’re so sweet. Thanks for all of the follows! You are very welcome :) I really enjoy your site! This is one of my favorite salads, I love the crunch and sweet and tangy. Thanks, Candi. Sweet, crunch, tangy–describes it pretty well! Oh, I LOVE strawberry spinach salad and your pictures are gorgeous. Before my tree nut allergy I used sugared pecans in mine. Almonds would be great!